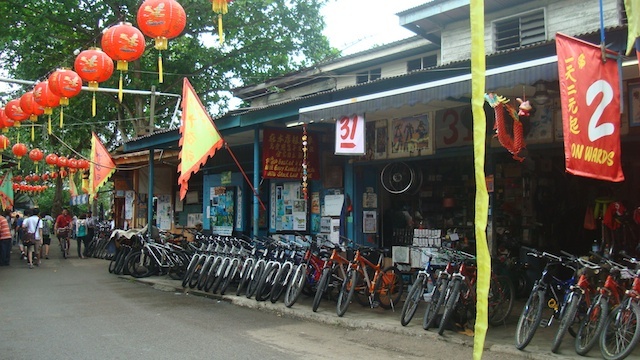 Apparently the Singapore of 40 years ago was besieged by bicycle hire shops. 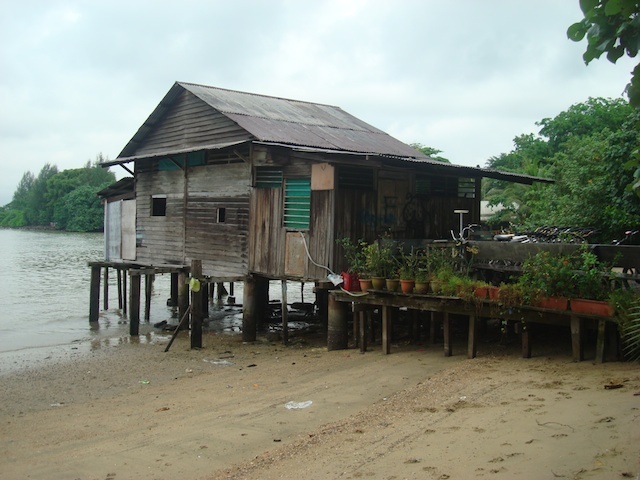 That’s if the often-used description of Pulau Ubin is to be believed. 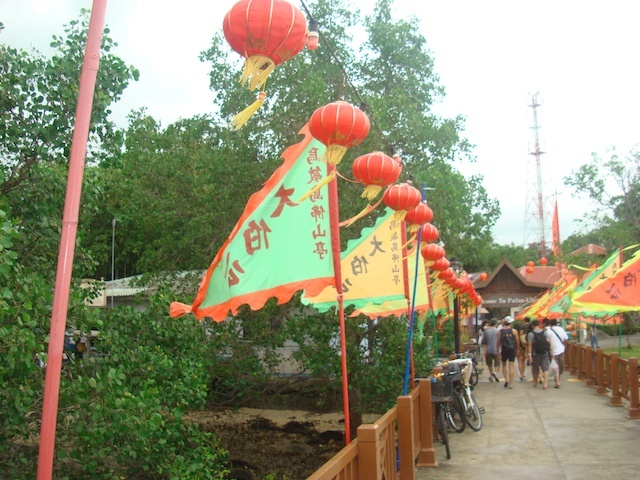 Pulau Ubin is a small island off Singapore. It’s promoted as “like the Singapore of 40 years ago” and I’ve been dying to go there for years. But I have been held back by a lack of eager traveling partners. My casual “hey, wanna go to Pulau Ubin” hadn’t worked on ANYBODY, not even Darling Man. I decided to engineer a visit, devising a sneaky and complex plan. I thought this type of plan was necessary because the instructions on how to get to Pulau Ubin seemed complicated. I roped in a couple of sidekicks, one Australian and one German. Once they were onside, I ambushed Darling Man. He couldn’t say no and, finally, I had a travel team. First stop, Changi Ferry Terminal in Singapore’s west, quite close to the airport. There we were supposed to catch a bumboat to Pulau Ubin for S$2.50 per person. The guide book said the bumboats would leave once 15 people were present. 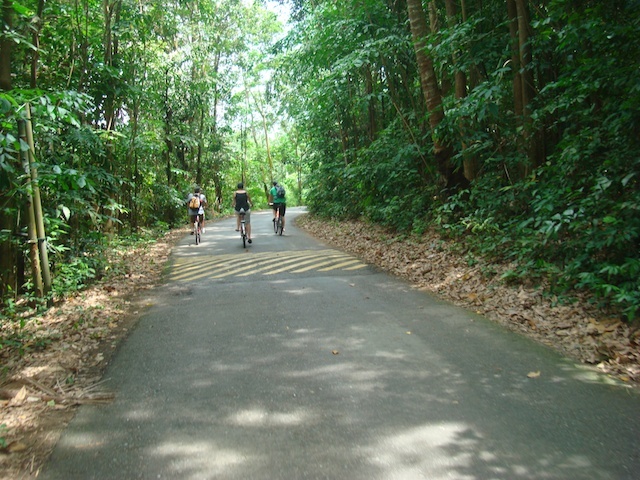 Getting to Pulau Ubin seemed like an onerous task. But once we arrived, bossy looking Singaporean uncles took charge, demanding to know how many in our party and ordering us to sit in the waiting area. Within two minutes of our arrival, one bumboat had filled with 15 and was off. After another two minutes, we were on board and on our way. And just 10 minutes more and we were stepping off the boat onto a festive-looking jetty, full of flapping flags. The holiday spirit took hold and we began investigating the island. The main street is so cluttered with bicycle hire shops that on first pass we completely missed the little restaurants. We were keen to get some bikes and get moving and soon we were. My sturdy bike with a baby seat on the back was S$12 for two hours. The others opted for cheaper bikes – S$9 for three hours. It was Miss M’s first time behind the driver. I think she felt a little miffed at the reduction in attention. After about 15 minutes she started getting whiny. We got off the bikes and chased her around with spoonfuls of the breakfast she hadn’t eaten. Even though she was doing laps of a composting toilet, she was happy on the hoof, unhappy in the bike seat. The law of inverse proportions strikes again. Our group split up again where the paved road petered out. I didn’t want to take the baby on gravel when the safety straps on the baby seat seemed so unsafe. We decided to turn back and wait at the drinks stall we’d just passed while the boys went on ahead. Fresh coconuts for S$3! We slurped and sipped and Miss M bathed in the adoration of the other thirsty travelers at the drinks stall. It was HOT. The drinks stalls were all pretty popular. Except for this one. Butterflies flittered as we cycled through the junglish paths, back towards the town. We were overtaken by a yellow-shirted bunch of schoolboys, balancing compasses and maps on their handlebars and shouting instructions to each other. Industrious, even on the weekend. Halfway back, Miss M fell asleep in the baby chair. She was slumped to one side, holding on firmly with one hand but with her little head lolling from side to side. It was no longer a relaxing ride for me. I couldn’t steer the bike and hold her or watch her. We made it to town, though, and stopped at the first restaurant we came to. It may not have been the best choice but it was the most convenient. There was a wooden bench for Miss M, a big fan nearby that could be pointed at her and a friendly waiter who brought us much-needed cold drinks. And, with so little exercise under out belts, we proceeded to order … a lot. And then it was time to go home. We were too hot and too full to try any more exercise. Miss M, as is often the case, barely ate all day. But getting home became very problematic. 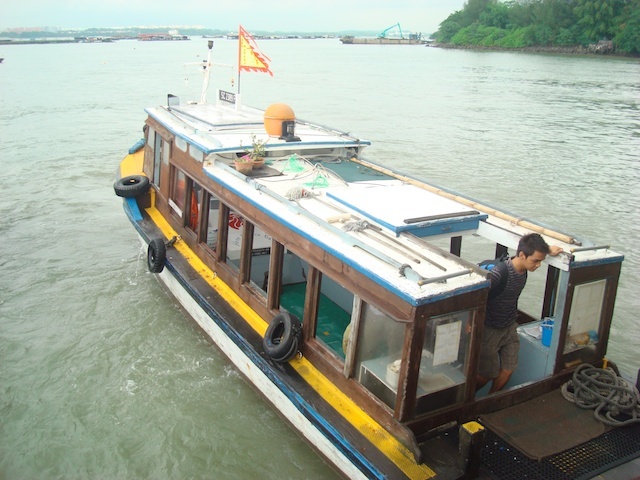 The bumboats were a breeze but we just could not summon a taxi to the ferry terminal. There were none taxis passing so we trudged over to a bus stop. It had taken us 15 minutes to get to the ferry terminal in a taxi. It took more than an hour and half on the bus to get home. And we had to change buses, so the bus fare for four was actually more than if we’d been able to get a taxi home. A frustrating end to a wonderful day. A weekend escape from Singapore we’ll be taking again, for sure. Especially now I know how to summon a taxi by SMS. Next time, before we head out to Changi Ferry Terminal, we’ll look up the postcode, which is required when ordering taxis by text. Getting to a hard-to-reach place is an accomplishment. It sounds like your adventure was worth it. I would have been glad to go along with you on this excursion. Sounds like a fun and interesting experience. The sign at the Pulau Ubin drinks stall is pretty funny. Love the sign and I too would have loved to visit with you. I’m always up for adventures back in time! i want to know why that bar wasnt popular? that sign is off the charts good, i would be there in a second! can imagine it must be great to occasionally escape the hustle and bustle of singapore. I think the bar/drinks stall was just too close to town. It was the first one on the way out. I’m sure it got busier later in the day. It is a pretty good sign, isn’t it? Looks like a nice getaway, and now you know how to make your trip easier next time. Worth the pain. That sign is priceless! So glad you snapped a photo! love this – that sign makes me happy! Glad to hear it. I’m happy when you’re happy! I adore time travelling. 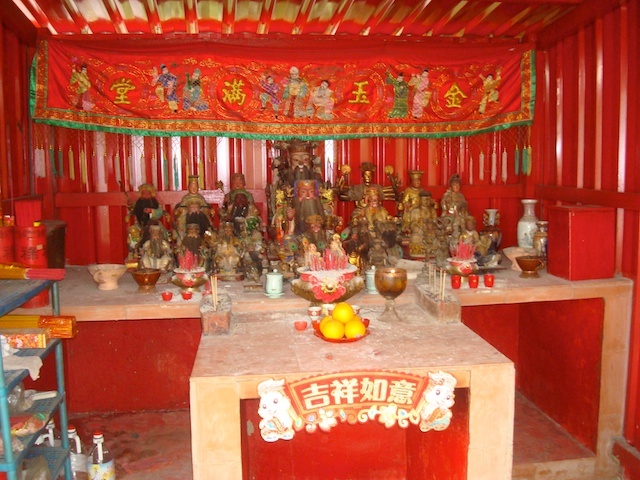 Also, we’re thinking of wintering (a great word, btw – that I want to bring back into use) in Singapore in 2013. This sounds like a fabulous outing. Luckily, my youngest will be 11 by then and can ride her own bike. What an adventure you had! Sounds like par for the course when traveling with small children. You’ve hit the nail on the head, Debbie! 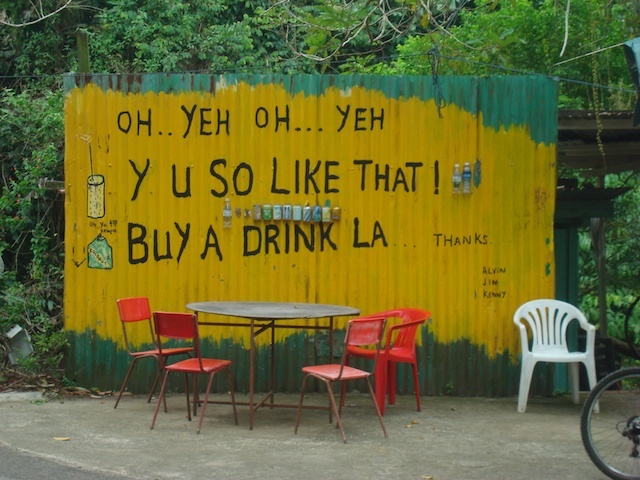 “Buy a drink la”… the sign says, I can imagine a Singaporean saying exactly the same words if he/she’s calling out to you. What an awesome adventure away from a bustling metro. Sounds like you all had quite an adventure. 🙂 And I had no idea you could summon a taxi via SMS! The taxi SMS service may be a Singapore thing. It’s a lot quicker than using their automated phone system, that’s for sure!